CROSS TRAIN AND ADD THE POWER OF THE NINJA TO YOUR TRAINING! ADD A NINJUTSU BLACKBELT TO YOUR ABILITIES. Already a BlackBelt in another art??? EARN ANOTHER BLACK BELT AT YOUR OWN PACE AT YOUR HOME OR DOJO. You can now add Ninjutsu to yours or your student’s cross training. You will be excited about this art and all it offers. I tell you this from my own personal experience. While studying karate with great instructors for almost 10 years I became very intrigued by other arts. Of course when I first started I focused on getting my black belt and becoming a good student, and a good representative of my art. I was very traditional and dedicated but something was missing. I wanted more skills – I didn’t want to miss anything – I wanted to learn it all. I wanted to become an ultimate warrior (with heart) and not be limited in my abilities.This passion led me into studying many systems and I earned a few more blackbelts -and then my boyhood dream came to pass – Ninjutsu. It seemed to have everything: the ultimate warrior, stealth, great ukemi, grappling (needed for a karate, TKD stylist), mind mastery, and protector of freedom attitude. I deeply sought it out and went to Japan to train with the legendary Ninja Grandmaster Hatsumi – in fact I’ve gone over 25 times and have been granted master status and full teaching authority from him. What I’m saying here is you now have an opportunity to add to what you already do. Give your martial arts career a new perspective and your skills new revitalization. I personally guarantee you will enjoy this art and it is always necessary to have a few tricks up your sleeve….. they might as well be Ninja ones! You are most welcome to train with us. I look forward to helping you achieve your goals. BTW, we are looking for a few more BlackBelt Certification Instructors at International Bujinkan Dojo AssociationTM, aka IBDA. * Expand Your Knowledge– We highly encourage you to become a better martial artist than you already are. Learn to better protect yourself and your loved ones. Develop better self confidence, gain the respect you deserve, better yourself and your life by getting a Black Belt in our authentic Ninjutsu system. True Ninjutsu is very hard to find. We personally have chosen Bujinkan Ninjutsu /Budo Taijutsu (as it’s now called by Grandmaster Hatsumi) as our art because of its unique diversification and time tested methods of several hundred years. An authentic full spectrum martial art, Bujinkan Ninjutsu /Budo Taijutsu is truly “Ancient Arts For Modern Times”. Master Richard Van Donk has made over 25 trips to train with Grandmaster Masaaki Hatsumi in Japan to bring this art directly to you. Our library of knowledge is extensive and available to you. * Earn Your Black Belt in Bujinkan Ninjutsu. Start your studies today and join others all over the world in Ninjutsu training. Whether you are a first time martial artist or are already very accomplished and run your own school, a certified Black Belt rank in Ninjutsu/Budo Taijutsu from Japan is a worthy & recognizable achievement. We are dedicated to helping you achieve your dreams. Your studies have been carefully designed and are very progressive. You will study both empty handed and weapon training as well as life enhancing philosophy. [See each video’s details in the Source catalog. Worldwide Students – Our BlackBelt Home Study Course has been a great success. Thousands of students just like yourself in over 40 countries all over the world are now studying this course while enhancing their lives. We’ve received hundreds of unsolicited testimonial letters from every part of the globe. We are very happy to give people (even in remote areas of the world) the opportunity to train in our once secret art as well as to help our friends in traditional dojos or training groups expand their martial arts training knowledge. Spend your spare time training with us at your own pace right at home & secure your next rank in the martial arts. | Become An Instructor?- As you may know the true art of Ninjutsu is not easy to find and due to the Ninja Boom movies many people are claiming to teach it with no true certification. Our lineage is deep from O’Sensei Takamatsu to Soke Hatsumi thru Shihan Van Donk to you. We are growing and are in need of instructors in many areas. Many people have become affiliated with us to start training groups of their own. How about you? After over 15 years of reseach we have carefully laid out the most comprehensive curriculum in Authentic Ninjutsu/Budo Taijutsu anywhere in the world. Our goal of the International Bujinkan Dojo AssociationTM – Bushindo University is to be the best source of Ninjutsu/Budo Taijutsu training in the world as transmitted by Grandmaster Hatsumi to founder Shihan Richard Van Donk, 10th Dan*****. Up to Black Belt level you will be introduced to an overview of our entire 9 school Bujinkan system. And then through each dan (upper BlackBelt level you will study primarily the Budo Taijutsu of one school at a time until you reach 10th dan. We have set the standard, you get the benefits. On these TEN great DVD videos are endless techniques, forms and philosophy, showing weapons use and the dynamics of this ancient art in a step by step learning format (including the names of techniques in Japanese for the serious student). 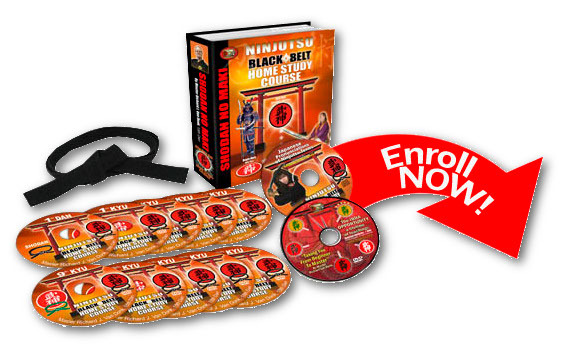 Nowhere else in the world is this information available, formatted as it is in this easy to learn Beginners to Black Belt, 10 dvd video system. No dvd video set is a substitute for a qualified licensed instructor, although many have used this very set to become one. The next one could be you. The set was designed to guide your progress as you watch moves over and over or frame by frame in slow motion as you practice them. Test in person or by dvd or video to 1st Kyu level. The Black Belt test itself must be done in person. You’ll know that you have really earned it and can wear it proudly. This series has been a real success. Students from all over the world in over 100 countries are training everyday with this Ninjutsu dvd distant learning course. We have enough information on this art that you could not learn it all in 25 years, if you trained everyday 10 hours a day. These teachings on this innovative Black Belt course cover the basics from 9 traditional Ninjutsuschools called Ryus in Japan. After you achieve Black Belt status you can continue on, learning each of the individual schools and becoming certified as a higher level BlackBelt such as 2nd degree, 3rd Degree, 4th degree all the way up to 10th degree (or dan as it is called in Japan). As a side note in Bujinkan Ninjutsu there are 5 levels of 10th Dan but we won’t have you worry about that yet. We’ve got to get you started first. Here’s a Partial list of what you will study. 9TH KYU- Intro Level One – Build your Bujinkan foundation with Basic Body conditioning, How to tie your Belt, Proper Bowing, Movement Basics, Natural Postures of Shizen, Seiza & Ichimonji, Earth Form, Evasion, Rolling frontwards and backwards, as well as Basic Punching and Kicking Skills. 8TH KYU- Learn Wrist grabs -applying locks and escaping from them, more Striking techniques. How to Be a training partner (Uke), blocks, More postures of Jumonji, Hoko and Doko No Kamae. How to do Cartwheels. Weapon- Hanbo (3ft wooden staff), you will be introduced to the Kihon Happo movements, the fundamental ways of moving upon which our art and most all of the martial arts are based. We start with the water form. The focus of this dvd is taihenjutsu or basic falling, leaping & evasion skills. 7TH KYU- Emphasis at this level is on having more flowing body movement with less effort. You need to be able to go to the ground effectively and be able to take your partner off balance using your body movement rather than muscle. You’ll learn side rolls, more advanced back rolls, standing, forward, backward & sideways breakfalls. The postures of Kosei, Hicho & Ihen no kamae are covered as well as Shuto (cupped hand) strikes & backward and sideways kicks. More punching drills, Kihon Happo & the Sanshin forms of Ka (fire) & Fu (wind) as well as the Gyaku Waza (wrist reversals) techniques of Omote Oni Kudaki & Hon Gyaku. Basic tanto (knife) techniques are also covered. Advanced rolling methods, breakfalls, Kicks, Fire & Wind feeling forms (SanShin), Beginning grappling (Kihon Happo), Knife understanding attacks, Postures- Ihen, Kosei, & Hicho, Posture flow drill, Oni-kudaki. 6TH KYU- At this level in your taihenjutsu (body movement skills) you should be able to roll without using your hands so that you can either pick up a weapon or take down an attacker as you are rolling. This dvd covers how to do this as well as Shiho Tenchi Tobi (4-way leaping skills), Shiho Geri (4-way kicking) and Sokoyaku Ken (heel/sole foot dance). You’ll learn the last set of the Sanshin no kata, the Ku or void feeling form. From the Kihon Happo you’ll practice the Jumonji no kata (crossed hand posture movement drill) & Musha Dori. The Kusari fundo,a weighted chain, is the weapon focus for this level (we always use a rope version for safety when training with a partner). The importance of meditation & diet are covered as well. Leaping skills in several directions, Thumb striking, Void feeling form, Medium level Grappling, Weapon -Kusari Fundo-(Rope/Chain) techniques, Advanced kicking including 4-way (Shiho tenchi Tobi). Meditation, Diet, More Kihon Happo. 5TH KYU- The focus at this level is learning the Kihon Happo movements with efficiency and knowledge of the Japanese names for each technique. This level is a major step and accuracy as well as good body flow is a must. Advanced kicking & punching methods practiced while going to the ground as well as Muto Dori Gata (empty handed sword evasion forms) are on this tape. You’ll learn how to strike using the Boshi Ken (thumb fist) & Shako Ken (claw fist), and to kick using Kakushi Geri & Sampo Geri forms. Continuing the Kihon Happo you’ll learn Hicho no kata (flying bird form movement drill) and Ganseki Nage (beginning throwing forms). Basic grappling forms are also covered at this level and the weapon focus for this level is Shuriken (throwing stars).Sword evasion forms, Medium level Grappling (Kihon Happo), Body grab escapes, Shuriken techniques, Beginning throws (Nage), advanced kicking and punching methods also done while falling. 4TH KYU- At this level you need to be proficient at taking your opponent off balance. This dvd reviews how important balance is in your training and in your life. You’ll also find jumping kicks, jumping & diving rolls, running up surfaces, wrist breaking techniques, leg sweeps & how to counter kicks all on this dvd. The weapon focus for 4th Kyu is the Rokushaku Bo (6ft staff) & you’ll learn basic strikes & distancing for this weapon. Jumping kicks, Countering Kicking attacks, leg sweeps, wrist breaking techniques, 6ft bo staff training basics and advanced, jumping and diving rolls, Flying techniques. 3RD KYU – At this point in your training your attention should be on your partner’s body & the effects that your movement & technique have on your partner. This dvd reviews the importance of this as well as introducing the sword, including how to hold it, 10 different sword kamae (postures) and the basic movements and cuts from each of the 10 postures. Advanced Taisabaki (body evasion) is covered on this tape, paying specific attention to distancing & timing, as well as advanced Ganseki Nage (throwing forms), power moves & damaging blows to crush your opponent. Sword postures (10 different kamae) , basic movement and cutting from each one, Throwing skills of ganseki forms, Silent movement, using nature, Fist and body harmony, power moves, damaging blows crush your opponent. 2ND KYU- Learn choking and strangulation holds, Knee and elbow strikes, Bone attacks, Climbing skills, How to draw a Sword several ways, Fighting from Sitting and kneeling, how use Hand claws, & Dream work. This level focuses on advanced falling, leaping, and evasion skills. Kuten (front handspring), Noburi kata (climbing trees, buildings, poles), and Suwari gata (kneeling forms): wrist grabs, reversals, throws and kicks from a kneeling position are shown. You’ll learn five new hand strikes: Shuki ken, Sakki ken, Shishin ken and Happa ken as well as Tai ken, the use of the whole body as a fist. Koppo jutsu or bone attacks and Shime waza go kata (the five strangle hold/choking techniques) are also taught on this dvd. Weapon of Shuko (hand claws) and Kenjutsu Shinobi Iai the art of properly drawing a sword are featured. Discussion on using dreams as insight into things that are happening in your life. 1ST KYU- This dvd covers Stealth movement and Gotonpo (body concealment methods using nature to escape). Koshi jutsu (organ and muscle attacks) are taught using points on the wrists, arms, shoulders, throat, face, back, chest and legs etc. Advanced throwing variations (henka) from the Kihon Happo movements of Ura Gyaku, Omote Gyaku, Musha Dori and Ganseki Nage are shown as well as Koshi nage (hip throws), Itami nage (pain throws) and a rare demonstration of Kuki nage (throwing without touching your opponent by using energy and intent only- no body contact). Weapon focus is the Kyoketsu shoge (long rope with circular ring on one end and a double bladed dagger on the other) and how to use Metsubushi or blinding powder. Stealth, Escaping from danger using nature (Gotonpo), Advanced throws (Nage waza), Organ and muscle attacks of Koshijutsu, Variations of advanced grappling forms, Rare Shoge weapon, Metsubushi blinding powders. SHODAN (1st degree material)- Knife and gun disarms, how to deal with multiple attackers, Kihon Happo reversing and countering techniques as well as natural taijutsu (body movement) with a gun. Breaking body balance, flowing from technique to technique, capturing the essence of the techniques, and getting your life to work for you are all covered on this dvd. If you have really been practicing, by this level of your training your life should be very different than when you first started training. You will be more confident, more relaxed and generally a happier, more aware, and more conscious human being. Now you are ready to really train! Knife and gun disarms, Handling multiple attackers, Reversing/countering techniques, Natural Gun shooting, breaking body balance, flowing technique to technique, capturing the feeling, Randori. This exciting 10 dvd video course is a complete learning system, teaching you not only basic but also very advanced techniques in a way that makes learning fun. This kind of instruction in Authentic Ninjutsu has never before been available to the general public in such an easy to understand and follow format! Start your Bujinkan Ninjutsu Black Belt journey Today! Be the Best Martial Artist that You Can Be!